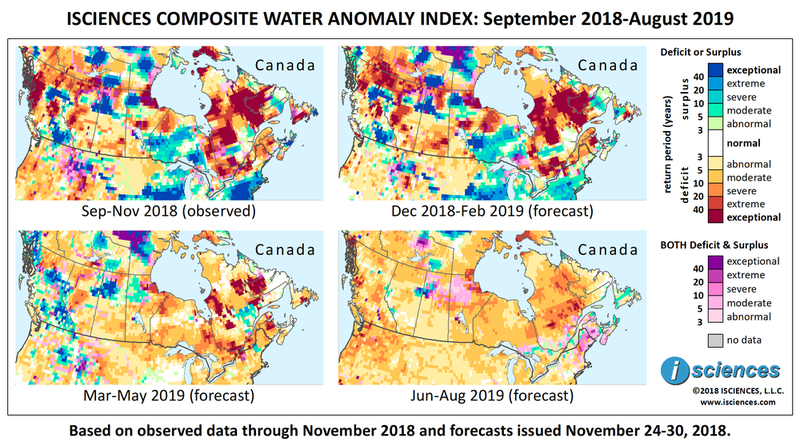 The 12-month outlook for Canada through August 2019 indicates vast pockets of intense water deficit in the east as well as some large pockets nearly as intense elsewhere in the nation. Relatively mild deficits are expected across southern portions of the Prairie Provinces. Areas of surplus include southeastern British Columbia. Intense deficits are forecast to encompass large blocks of the eastern half of the nation including in: Quebec from the Caniapiscau Reservoir to beyond Michikamau Lake in Labrador, near the Gulf of St. Lawrence, around Lake Mistassini, and the Gatineau River region near Ottawa; Ontario along the eastern border. Severe to exceptional deficits are also forecast for: northeastern Manitoba along Hudson Bay; the Upper and Middle Athabasca River region and northwestern Alberta; the Upper Fraser River Basin in British Columbia (BC), and the Skeena River region in northwestern BC. Areas of surplus include: northern Nova Scotia and Prince Edward Island; northwestern Manitoba; northwestern Saskatchewan around Churchill Lake west to Fort McMurray, Alberta; northern BC around Williston Lake and along the Peace River past Fort St. John; and, southeastern BC. The forecast through February indicates a pattern of anomalies similar to the prior three months. However, deficits are expected to increase and intensify in southern Saskatchewan where anomalies will be severe to exceptional. The overall pattern of persistent anomalies during this period includes the conditions that follow. Widespread, exceptional deficits are forecast across central Quebec (QC) into central Labrador, and intense deficits in southern QC in the Ottawa-Gatineau River region and across the border into Southern Ontario (ON). Intense deficits will also persist along the Ontario-Quebec border corridor, and in the Severn River region of northwestern ON. Surpluses will persist in much of the remaining area of ON. In Manitoba (MB), intense deficits are forecast in the northeast around Hudson Bay and north of Lake Winnipeg; intense surpluses are expected in northwestern MB. In Saskatchewan, deficits will increase and intensify in the south, as previously noted; intense, widespread surpluses are forecast in the northwest and across the border past Fort McMurray, Alberta (AB). Deficits in the Middle Reaches of the Athabasca River in AB will intensify, becoming extreme, and exceptional deficits in the Upper Reaches will persist, as will intense conditions in the far northwest of the province. And in BC, intense surpluses will persist in the southeast and in the northeast from Fort St. John past Williston Lake; deficits in the Skeena River region of the northwest will shrink but persist with intensity. From March through May, the extent of exceptional deficits will shrink in QC and nearly disappear elsewhere in the country, but intense anomalies will persist, notably in the Ottawa-Gatineau River region in southern QC leading past Montreal to Quebec. Surpluses will emerge in QC west of Manicouagan Reservoir. Conditions in Northern Ontario will transition from surplus to deficit. Deficits in the southern portion of the Prairie Provinces will moderate, and deficits farther north, while downgrading, may be severe. Surpluses will increase in BC. The forecast for the final three months – June through August – indicates widespread mild to severe deficits blanketing much of the nation along with some pockets of greater intensity. Surpluses will emerge in Newfoundland, and will shrink but persist in northwestern SK.